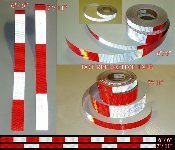 Welcome to REFLECTS LIGHT ONLINE STORE - Division of Reflective Inc.
On this site we carry Ultra High Intensity "Prismatic" Reflective tapes manufactured by Orafol (formerly Reflexite) in the USA. Prismatic reflective is visible for thousands of feet versus hundreds for standard reflective films. This makes it a perfect fit for applications where the object being marked needs to be seen from a long distance away. We have several specialty tapes. 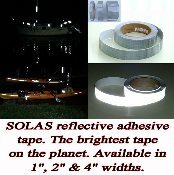 SOLAS is our brightest tape and is used for marine applications. 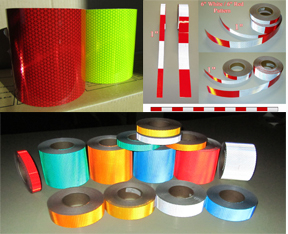 DOT conspicuity tape is the red and white tape commonly seen on tractor trailer rigs. Railcar Tape is used on trains. School Bus Tape is the bright yellow tape seen on school buses across the country. 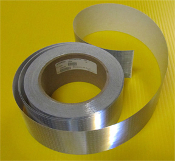 Reflective Gate Arm Tape is the new standard for gates and gate arms. For emergency vehicles we also carry "Reflective Chevron Striping. For photoelectric applications we carry Oralite P82. Our standard rolls of prismatic reflective are available in multiple colors. They are as follows - Our BRIGHT High Intensity Prismatic Type 4 film (HIP) in 30' and 150' rolls is highly reflective and also very vivid in standard daylight. Our BRIGHTER V92 Daybright in 30' and 150' rolls. And our BRIGHTEST V82 film also available in 30' and 150' rolls. V98 Conformable Prismatic in 30' and 150' rolls is very popular for emergency vehicle striping. To view our glass bead based engineer, high intensity and barricade reflective tapes click here to go to shop.reflectivestore.com. If you have any questions please feel free to contact us at this link. 1", 2" x 30 foot rolls of Oralite 5900 High Intensity Prismatic Tape. 45% brighter than standard high intensity tape. White, yellow, red, green, blue and orange. 1", 2", 4", 6" x 150 foot rolls of Oralite 5900 High Intensity Prismatic Tape. 45% brighter than standard high intensity tape. White, yellow, red, green, blue and orange. 1", 2", 3", 4", 6" x 30 foot rolls of Oralite (Reflexite) Prismatic Tape. 5 times brighter than engineer grade. Available in white, school bus yellow, red, green, blue and orange. 1", 2", 3", 4" & 6" x 150 foot rolls of Oralite (Reflexite) Prismatic Tape. Similar to diamond grade. Very bright tape. White, school bus yellow, red, orange, blue and green. 1", 2", 3", 4", 6" x 30 foot rolls of V82 Oralite (Reflexite) Prismatic Tape. 5 times brighter than engineer grade. Available in white, yellow, red, green, blue and orange. 1", 2", 3", 4", 6" x 150 foot rolls of V82 Oralite (Reflexite) Prismatic Tape. 5 times brighter than engineer grade. Available in white, yellow, red, green, blue and orange. Reflexite V98 Conformable Reflective Tape. Used where maximum day and night time visibility is needed. 1", 2", 4" and 6" rolls in 30 foot rolls. Easiest tape to apply. 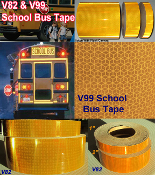 1", 2", 3", 4", and 6" Oralite (Reflexite) V82 (10 year) reflective school bus yellow conspicuity tape. Very bright & rugged. Aggessive adhesive. Reflexite Photoelectric sheeting is designed for use with retroreflective type photoelectric sensors, either with or without the use of polarizing filters. Oralite (Reflexite) Yellow FRA 224 stamped Rail Car Train Reflective Tape. 4" rolls in 30 or 150 foot lengths. Very bright prismatic tape. Can be used on rail cars and in a variety of other applications. 6" x 30' rolls of Reflective Chevron Striping Tapes to comply with NFPA 1901. Available in Reflexite Prismatic V82, V98 Conformable and Nikkalite Crystal Grade Type 8. 6" x 150' rolls of Reflective Chevron Striping to comply with NFPA 1901. Available in Oralite/Reflexite V98 Conformable, Reflexite Prismatic V82, and Nikkalite Crystal Grade Type 8.